My card is 6x6 inch Linen embossed cardstock. holly printed vellum also from my stash (it's been there forever). The image was coloured with my Sakura pens & some promarkers for shading. using an Xcut punch. The added gems were also from my stash. A little side view to show the glitter & shine from the Sakura pens. 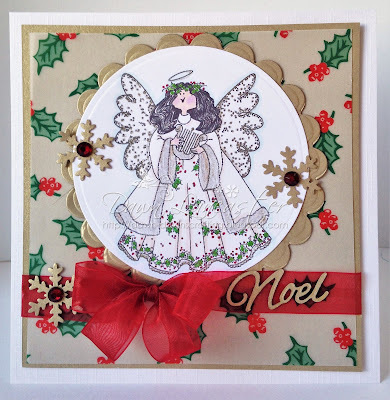 Morning Dawn, a gorgeous angel and beautiful card. I hope you have a wonderful week. Hi Dawn, gorgeous card. Love the layout and a beautiful image. Morning lovely, this is so cute ! that angels face i just love. I love your sweet angel image! Great use of the challenge colors. Thanks so much for joining us at Just Us Girls! Adorable! Lovc the angel and the gold accents! Thanks for joining us at 4 Crafty Chicks this week. Beautiful card Dawn, I have this gorgeous image will have to find her I think. A pretty card Dawn, such a lovely angel and great papers. Beautiful angel stamp, gorgeous card. what a sweet christmas angel! thanks for joining us at Quick Quotes this month!! How very pretty! 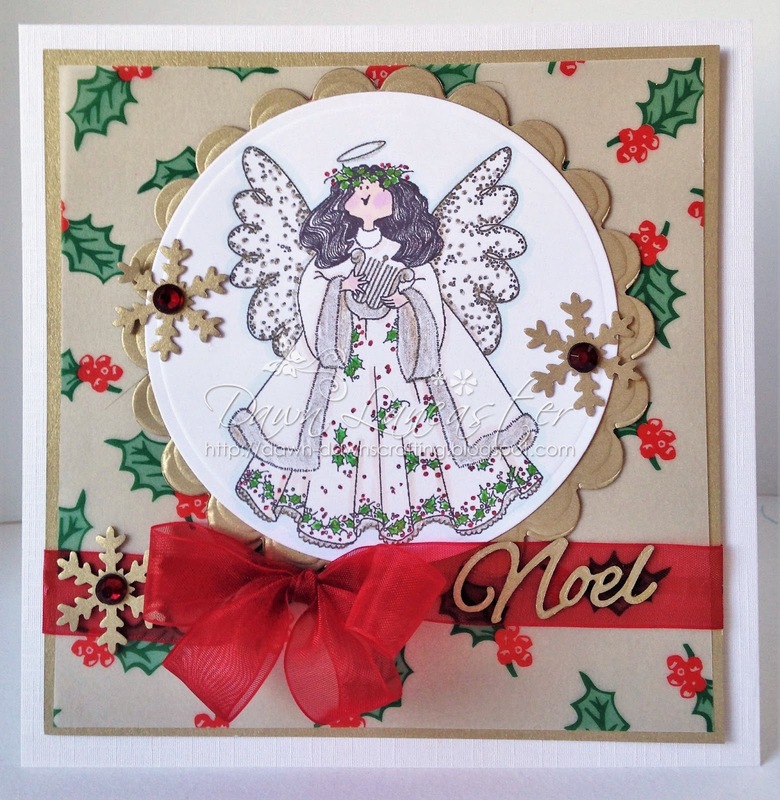 Love the beautiful angel, great detail! 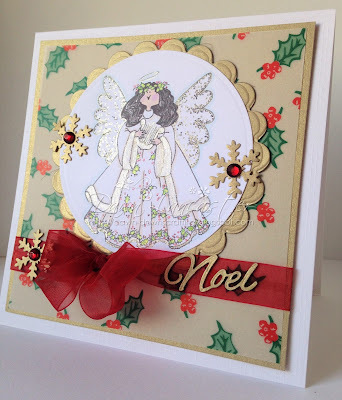 Love the side photo of your gorgeous card...you can really see it shimmer! Beautifully done! Thanks for playing along with us over at Just Us Girls this week! Thanks for joining us at Quick Quotes! Hi Dawn, I just popped back to say thank you for joining us at A Gem of a Challenge.